Bead, gold-finished brass and rhinestone, peridot green, 5x2mm rondelle. Sold per pkg of 10. Item Number: H20-3122MB Have a question about this item? 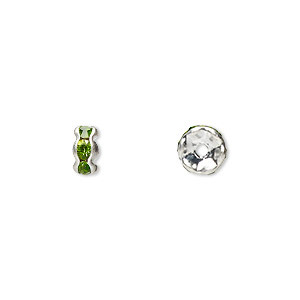 Rhinestone rondelles can be used with gemstone beads to add sparkling highlights. Bead, gold-finished brass and rhinestone, peridot green, 6x3mm rondelle. Sold per pkg of 10. 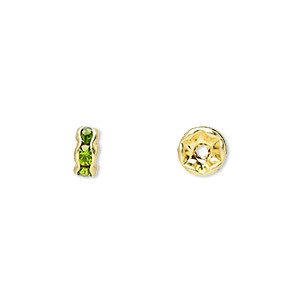 Bead, gold-finished brass and rhinestone, peridot green, 7x3.5mm rondelle. Sold per pkg of 10. Bead, gold-finished brass and rhinestone, peridot green, 8x4mm rondelle. Sold per pkg of 10. Bead, glass rhinestone and silver-plated brass, peridot green, 5x2mm rondelle. Sold per pkg of 10. Bead, gold-finished brass and rhinestone, emerald green, 5x2mm rondelle. Sold per pkg of 10. Bead, gold-finished brass and rhinestone, sapphire blue, 5x2mm rondelle. Sold per pkg of 10. Bead, gold-finished brass and rhinestone, red, 5x2mm rondelle. Sold per pkg of 10. Bead, gold-finished brass and rhinestone, garnet red, 5x2mm rondelle. Sold per pkg of 10. Bead, glass rhinestone and silver-plated brass, peridot green, 6x3mm rondelle. Sold per pkg of 10. Bead, gold-finished brass and rhinestone, black, 5x2mm rondelle. Sold per pkg of 10.